Icheckmovies 1910 Features over 100 checks. 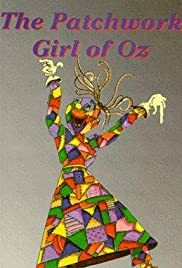 "The Patchwork Girl of Oz" is one of the three Oz films produced by author L. Frank Baum's own production company. And, as to be expected, it's childish for sure. Supposedly, there's humor in characters jumping around and moving about erratically. Violet MacMillan plays a munchkin boy, but is very obviously a woman. Additionally, the static shots from a stationary camera make it a typically primitive film from 1914. But, there is also some inventive fantasy design--in the story, its odd places and characters, the costumes (even the silly animal ones) and the sets. The trick shots, such as stop-motion animation, are very basic, even for 1914, but nothing more was needed. Children of today could still probably have fun watching this, but even for adults addicted to silent films, like myself, it may be too childish. Yet, they transferred the fantasy from the book very well and that made it worth a look for me. And, the film's faithfulness to the book shouldn't be in question, as Baum worked on this adaptation himself. It's also interesting how far back children's movies and fantasies go in film history. It's been sometime since I saw the two follow-ups to this film: "The Magic Cloak of Oz" and "His Majesty, the Scarecrow of Oz", but I remember them as more of the same.